Also known as the southern or eastern bettong, these little creatures were once common along the coastal areas of eastern Australia, from south-east Queensland to the south-east tip of South Australia. Due to the introduction of the red fox and the European rabbit, this species of bettong is now extinct on the mainland, and has a ‘near threatened’ classification in Tasmania. You’ll only find the bettong in the eastern part of Tasmania as they prefer dry, open eucalypt forests and grassy woodlands. They are nocturnal animals, spending daylight hours in a domed, camouflaged nest of grass. The easiest way to describe a bettong is as a ‘tiny kangaroo’. They have the distinctive hind limbs, perfect for hopping, and short forelimbs. They are coloured brown-grey on top and have white or light bellies. The tail of the bettong is as long as the head and body and usually has a white tip. The tail is usually for balance (much like the kangaroo), but is somewhat capable of gripping items - if they’re very light! Bettongs typically reach 2 kg in weight and around 30cm long (head to tail). They also use their little tails to carry nesting material - just like this. 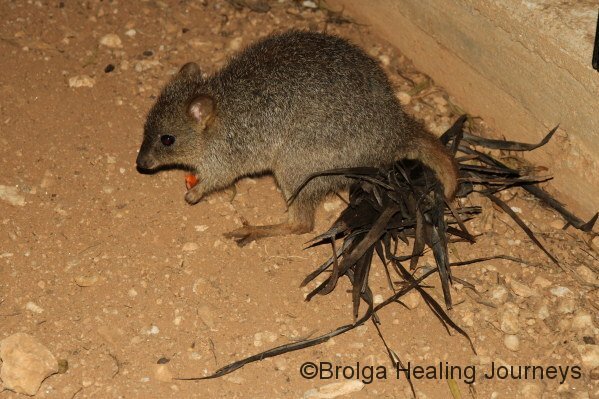 Bettongs will eat seeds, roots, bulbs and insects - but their favourite meal is underground fungi. Their forelimbs are great for digging up this delicacy, which makes up a fair portion of their diet when available. Fungivores are an often forgotten crucial link to the health of the forest through the dispersal of fungi spores. Fungi is believed to be somewhat of a “communication network” for the forest. Bettongs have no specific breeding season, and are capable of giving birth throughout the year. Gestation is 21 days. Joeys will spend 3-4 months in the pouch, and weaning occurs at 5-6 months. Because of the relatively short time that young bettongs spend in the pouch, Mum Bettongs can produce up to three joeys a year. They reach sexual maturity at around 12 months of age, and will live for 3-5 years in the wild. Near threatened. While ‘common’ in Tasmania, bettongs are wholly protected as their habitat is threatened by land clearing (through timber harvesting) and excessive grazing of stock. Repeated use of 1080 poison for wallaby control on private land and the recent introduction of foxes in Tasmania also affect their status. Male bettongs do not help out with the parenting, they are mostly solitary animals except when mating and when the mother is raising a joey. A small population of bettongs were introduced into protected woodlands in Canberra in 2012. They’re doing extremely well with plans to triple the size of the area. The bettong can travel up to 1.5 km from the nest to a feeding area - quite a journey for such a tiny animal!